Is MiracleWin a Scam or Legit? Read Reviews! MiracleWin Exposed — It Might Take a Miracle to Win! Looking at MiracleWin.com, at first it looks like a pretty good site. This is an online lottery syndicate provider for two games and two raffles. It all looks pretty straight forward. EuroMillions and the UK Lotto do get up to some good numbers. But how good are their syndicates really? The Bronze syndicate has 5 tickets for the Wednesday & Saturday UK Lotto weekly and 10 tickets for the Lotto raffle plus 5 tickets for the Tuesday and Friday Euro Millions draw and 10 tickets for the Millionaire raffle. Keep in mind that both raffles are for a guaranteed one million pounds. Silver increases to 10 tickets for each draw and 20 for each raffle per week. MiracleWin.com’s Gold syndicate increases to 15 tickets for each draw and 30 for each raffle per week. You have a choice to play weekly, monthly, quarterly or yearly – or only weekly, only monthly, only 3 months, only 6 months or only one year. The big difference here is whether the subscription automatically renews or not. Discounts apply for the longer you commit to play. Bronze has discounts of 15% (quarterly), 20% (six months) and 30% (annual subscription). Silver starts its discounts at weekly with 15% and then 29%, 33% and 44% respectively. Gold also has a weekly discount of 25% and then 37%, 41% and 51% respectively. Each subscription owns one share of a total of thirty-six. If you look at the overall weekly allotment that’s pretty good as you’re in say Bronze of 160 tickets a week. But, when you look at an individual draw on say Bronze, it’s only 5 tickets for the lotteries and 10 tickets for the raffles. That’s not a great ratio. One of the things that caught the team’s attention in the terms and conditions is the fact “the number of games or the number of members in a syndicate may vary from time to time without notice at the Company’s sole discretion”. I’m not really sure what this means. They also go on to say that the company gets any winnings where shares are not owned by a member. I guess that means they will buy up any shortfall from the 36 members in each syndicate. Players can withdraw funds if they have more than £10 in their account. Simply log into your account and you can request the money. But, if you want to withdraw more than £500 then it’s going to take longer. They say they’ll tell you by email what you have to do at the time of the request. There is no info on commissions or fees taken for sending you your money, but it goes into a bank account. There are no contact menu or contact details except an email address. There are no phone numbers, no snail mail address or live chat. 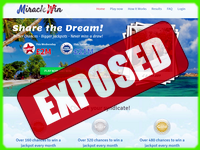 MiracleWin.com is owned by Aleph Ltd., a company registered in the British Virgin Islands, though don’t look for this info on their web site. We got that answer through their email – and in fairness, it was within 24 hours. Would you mind rating MiracleWin.com? Though they did respond by email fairly quickly, I don’t like the idea there isn’t a phone number or actual location for these folks. The team also thought the actual share ratio for the syndicates is not great. Sorry, but this site does get a thumbs down on their syndicates offered. The games are limited and the ratio of shares per tickets just doesn’t cut it. No phone number is a real problem to me. If I am going to give my personal details, especially a credit card number, I want to be able to find these guys. I want to know more about them. There are enough good online lottery providers that offer good contact details, especially live chat.